The world seems to like round numbers. In Baseball 300 wins or 3000 hits, 500 home runs or 3000 strikeouts are magical numbers. 499 home runs? When is he getting to 500? 100 pounds lost is not much more of an accomplishment than 99. I have been at the 99 mark for a couple of days, actually climbed back down to 96 for a day or two, had the weight swing high and low and then today I stepped on the scale and it read 205.6. 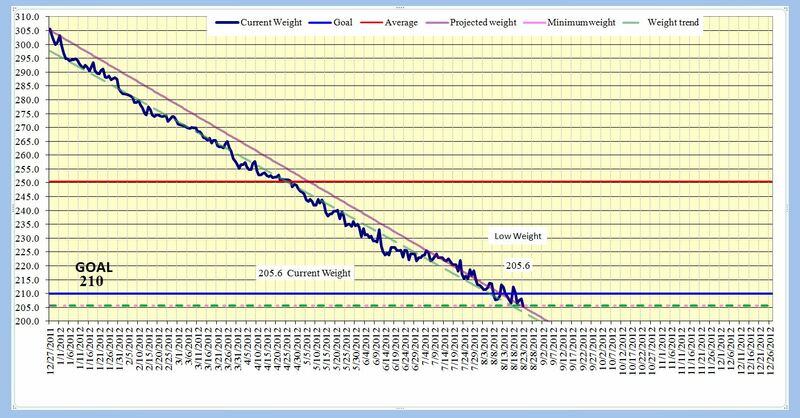 Two-hundred and forty days ago when I started this Journey my scale read exactly 305.6. It doesn’t equal anything on the waist. Still a 34-35. Shirt is still a large. Yet that one pound has significance to me that I can hardly put to words. When I started this Journey people would tell me that I was not fat. Big? Sure, but not fat. I don’t know if I carried it well (no, I really didn’t), if people were being kind, or if we are all really bad judges of weight and proportion. 305+ pounds is fat. Even at 6’1″+, I was fat, not overweight, I was obese. Now that I have lost the weight I think people can see that I was truly huge. 99 pounds was a big number. It represented many days and nights of concentration on the cause, on the goals, on the plan, on the Journey. Since very nearly the start of the journey I was intent of getting to my college weight of 210 pounds. A weight loss of about 95 pounds. I knew even when I set that as my goal so long ago that I would push to get to that nice round even number: 100 pounds. Better than 99 home runs. At 205.6 pounds I can now say I am not fat, not obese and the BMI charts be damned, I am not really overweight. I am still carrying a little extra weight but I am fit and healthy and I am trim. And I am 100 pounds less than the day I started the Journey. Imagine please: I have lost the equal of a 12-year-old boy. The equal of two large sacks of potatoes. 100 pounds. Seems much bigger than 99 pounds when in reality it is only one 16-ounce glass of water. I am still on my Journey. The goal is now 5 more pounds, get to 200. Look down between my feet and see 200 on the scale. Maybe even 199 once in a while. I have friends, people who have known me for 33 years who have never known me as light as I am today. Imagine. I was a lean and fit 18-year-old but not as light as I am today. Because Life is like This. I am antsy. I want to hike. I want to walk. Mostly, I want to Cycle. I do walk but by the end of the day my knee is hurting a great deal and so I don’t push it by going to the track. I tried cycling, that didn’t go well. Hiking is OK as long as the trails is fairly easy but I know when I am doing it that I will pay for it that night. So it is work that is giving me the exercise. I never thought running like crazy at work would be a positive. In this case, in this way it is. This is what it looks like…. I have a record of every pound I have lost since I started all this. I kept a spreadsheet and faithfully logged every mornings weigh-in. All 100 pounds are there. I have watched the chart display each and every step along the way. Some up, most down. It looks like the profit and loss chart of a business going under. Or maybe Facebook’s stock. My emotions have traveled pretty much the same course in reverse. Some down days, most up. Today is an UP day despite a very hard and frustrating day at work. The bump up in my mood from seeing the 100th pound come off has made it possible for me to not go over the edge today. I have wrapped so much of myself in to this Journey, this pursuit of the goal. I am almost at a loss now for what happens next. I will maintain the loss, I am sure of that. I have a much healthier approach to food now. I know that I can and will continue to follow this course. Imagine this: to lose 100 pounds I had to burn 350,000 calories more than I consumed through food and drink. In 240 days. That is nearly 1460 fewer calories consumed each day than my body burned. That is how you lose 100 pounds in 240 days. So that is the recipe. Eat less. Move more. Bring fewer calories in to the body and burn more by moving more. No matter what you may hear or read… That is the only way it works. Eat less. Move more. Categories: bicycling, Cooking, Cycling, depression, Emotional Well-being, Friendship, Fruits and Vegetables, Hiking, Knee Injury, Proper Nutrition, Rebirth, Running, Vegetarian, Walking, weight loss | Tags: cooking, Cycling, diet, excuses, exercise, fear, fitness, food, Friendship, health, healthy-living, Hiking, Hunger, Rebirth, Running, Vegetarian, Walking, weight loss | Permalink. You’re absolutely right about the emotional boost one gets from that extra pound that puts you at 100 pounds down. I feel the same thing when I can cross my weight boundary that changes the tens digit. I fear that when your scale displays 199.9, your head will explode.